little butterbean who will be home tomorrow. That is too cute, Janet. I'll bet that would be a huge hit at a Nationals Auction (hint, hint, hint). 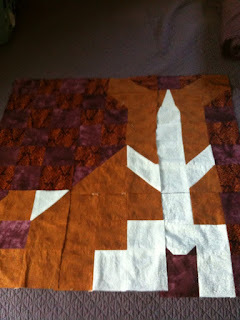 Well - this was planned as a test drive for a quilt to be donated for next year's rescue raffle. LOVE it! I have done the Silver Lining Originals corgi paper piecing pattern before (and also the freezer paper applique pattern of a corgi head) but this one looks awesome! And pretty easy, I might have to work on a wall hanging!